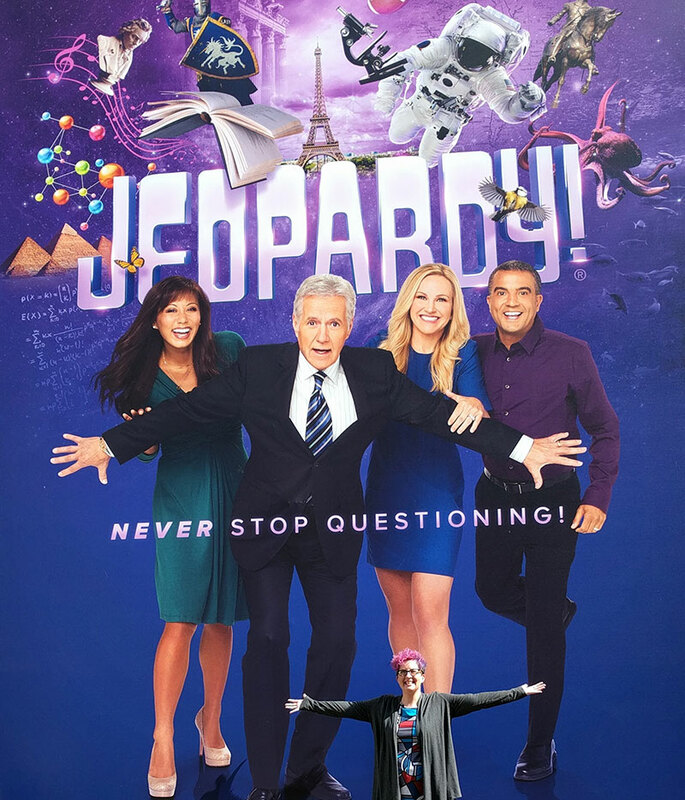 Outside the Jeopardy! studio with giant Alex and the giant Clue Crew! We flew out in the early afternoon, so we could arrive at our hotel right around check-in time. We didn’t even rent a car; it would have been more than a hundred bucks a day, and the hotel was only three or four miles from the airport. Plus, I was scheduled to be picked up by a studio shuttle at 7 AM, so we’d just need a taxi or a Lyft from the airport to the hotel and back again. Our flight was uneventful, and we made it to the hotel with no problems. Our room was ready, so we were able to head up, take a quick nap, and then think about dinner. We opted to go to BJ’s Brewhouse, which was a short walk from the hotel, and has plenty of gluten-free options, including a decent gluten-free pizza. We went early and got to the restaurant at 5:30, because we wanted to be back in the room by 7 PM to watch that day’s episode of Jeopardy!, for one last chance to get the feel of everything before going to the studio and doing it all live. Turns out, an hour and a half was almost not enough time for a couple of pizzas. The service was incredibly slow in general, and the kitchen seemed backed up. Still, my gluten-free pizza (and Scott’s gluten-rich pizza) came out around 6:15. I went to pick up a slice, and it was thicker and heavier and softer than usual. (The gluten-free pizzas at most places are more of a softer flatbread.) I picked it up, and discovered that they hadn’t separated the crusts—my pizza was made up of two gluten-free crusts, and their trip through the oven had basically steamed between them. So I had pizza toppings on top, a crisp bottom, and a layer of hot, soggy, pasty grossness in the middle. Our server came by, and I showed her the problem, lifting up the top layer of dough to reveal the wet layer beneath. She apologized profusely and took it back. I also asked her for the bill, so that we could settle it up and have that done. Scott started eating, because with the slow pace and the re-cooking, we were starting to look tight on time. …only to discover that it was the exact same two-crust wet pizza. Colder now, because it had probably just been sitting in the kitchen since it was taken back there. It certainly wasn’t cooked any more than it had been before. When our server came back around, we asked to see the manager. We clock-watched from 6:35 to 6:50, waiting for the pizza. And waiting for the server to bring the check, since she wasn’t sure if the manager was going to take my pizza off of the bill or not. They did end up taking the pizza off the bill, which was nice (but not necessary, since I was still getting a pizza from them), and a boxed-up pizza was brought out. Did I check it over before we left? You bet your buns I did. Pizza boxes in hand, we hoofed it back over to the hotel, got in our room, and turned on the TV in time to catch the intro music. So instead of a decent restaurant meal before my day of filming, I ended up eating pizza sitting on our hard hotel bed, with a hotel towel draped across my lap, shouting out answers as I ate. In a way, it was probably good. It gave me something to stress out about that wasn’t show-related. I ironed my clothes for the next day while watching Wheel of Fortune afterward. (They tape multiple shows a day, so everyone has to bring a few changes of clothes—if you win, you change clothes to make it look like a different day.) Then I tossed and turned for a lot of the night, thanks to the hotel being near a freeway and having a really, really hard bed. (My arthritic hips weren’t very happy with me.) Then I was up at 6 AM the next morning to pack a bag with clothes, throw down some breakfast, and meet up with the studio shuttle at 7 AM. I was up at 6 in the morning, which wasn’t too bad—I’m usually awake between 5:30 and 6 anyway, thanks to cats stomping around our heads and purring and poking at us. So at least it didn’t feel weirdly early. I had leftover pizza and a protein bar, packed a bag full of spare clothes, and prettied myself up. (I didn’t put on makeup, but then again, I usually don’t wear any. We were told to wear none, of a minimal amount if we were uncomfortable with none, so I knew some makeup torture was going to happen later.) I made sure I had all of the paperwork I needed to take with me and headed down to the lobby. There were a couple of other contestants already waiting downstairs: Lisa, a professional musician; and Lily, who it turns out had been in my in-person audition group back in Seattle! She’d also received the call the Monday after we auditioned; I wonder if they try to keep the genders fairly well-balanced, but were short on women with personality. We were joined by a few other players, climbed in the van, and drove across the way to the other hotel (if we wanted to take the shuttle in, we had two hotels to choose from) to pick up a couple more contestants. It was our shuttle driver’s first day, so it was a little harrowing having him ask two of the contestants who hadn’t played the day before if they could give him directions once we got to the studio lot. All told, there were 12 of us in the contestant holding room: the returning champion, 9 out-of-town players, and two local alternates. We found out that our names would be drawn immediately before each show, so until your name got called, you didn’t know which show you’d be in. The first part of our morning was spent getting ready. First, we signed some more paperwork and had our IDs checked. Then we rotated through the makeup stations, went over the three interesting anecdotes that were on note cards for Alex, and confirmed how our names are pronounced. When it was my turn in the makeup chair, I let the makeup artist know that I usually didn’t wear any. I don’t know if she put less makeup on me than normal or what, but I tell you what, it was a LOT. (Since I’m writing this just after it happened, when it’s still fresh, I haven’t seen how it looks on TV yet. Can’t wait to see.) I do know that even after a lot of washing back at the hotel that night, I still had a semi-smoky eye. At least she gave me a fairly neutral lip color. It was just about as heavy a layer of makeup that they do for special-events actors at Disney, but at least I didn’t have fake eyelashes glued on this time. As we rotated through the stations, we were told about a lot of the rules and guidelines. It was hammered into us to be as precise as possible with how we pronounced things, and to be careful about dropping letters from our answers, or mixing up letters. We had a representative come in and talk to us from the “lawyers,” which I don’t think were actually lawyers (or maybe they were; things were intense in my brain, so it’s hazy); at any rate, they’re the people who do the drawing of names and making sure that there isn’t any cheating or collusion, and who deal with any rule violations or challenges. Finally, we were herded out to the stage to do some rehearsing. And by that, I mean THE stage. People always say that live TV studios are much smaller than you expect, and this was no exception. It’s exactly like you see it on TV, but in a way it’s like a tiny shoebox version of what you see on TV. We were instructed on how to use the signaling devices, and how to use the stylus for writing our names and Final Jeopardy! wagers on the screens. They demonstrated the lights that come on at the sides of the game board to indicate that Alex is done reading the clue, and our signaling devices were live. We got to see the red lights come on at the front of our podiums when we were the ones to ring in successfully. We learned about how the dividers that separate the contestants during Final are now motorized, which is a relatively new upgrade. And we got to see that behind the podiums where everyone stands, there’s about a two-foot-by-two-foot platform that raises up out of the stage, so they can boost up shorter contestants and bring them to roughly the same height as taller contestants. 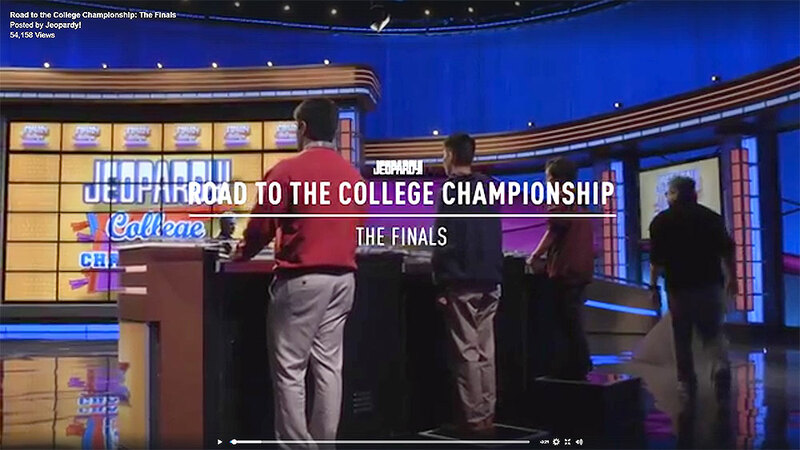 Here in a still from Jeopardy!’s video about the road to the college championships, you can see the platforms—Lilly, who won the college championship, is up surprisingly high, since she’s fairly short. It’s one more thing to keep in mind, that you can’t move around too much or you’d fall off, but it isn’t that bad once you’re up there since there really isn’t anywhere to go. Then we rotated through playing some mock games, using the real game board and the real buzzers. I was a little worried that I wouldn’t be able to read the clues clearly, that they’d be too small and far away. (They don’t expand to fill the screen like they do at home; you’re reading the clue in that same single box that contained its dollar amount.) 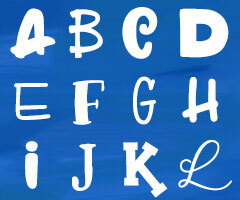 But it was fine—the text was large and clear enough to read. Every time someone came up to rotate through the mock games, they got to write their name on the screen for practice, and they got a clip-on mic attached, so the sound guys could get our levels. I should mention that during all of this, we had a team of people around us joking, and reassuring, and generally doing a fantastic job of keeping everyone relatively at ease and comfortable. They were all amazing, and I can’t thank them enough for helping to make the experience an amazing one. The contestants came out and got microphones put on, and their platforms raised if necessary. Then it was game time! 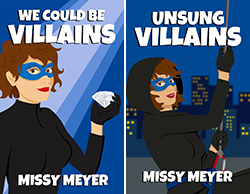 Next up, part 3: SHOW TIME!